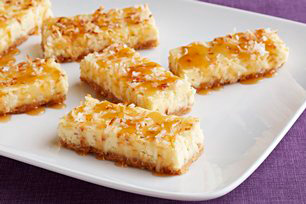 Our coconut cheesecake squares are creamy and delicious. With their graham crumb crust and drizzle of warm caramel topping, these coconut cheesecake squares are sure to be requested again…and again! Mix graham crumbs, butter and 1/4 cup sugar; press onto bottom of 13x9-inch pan. Beat cream cheese, vanilla and remaining sugar in large bowl with mixer until blended. Add eggs; mix just until blended. Stir in 1 cup coconut; pour over crust. Sprinkle with remaining coconut. Bake 30 min. or until centre is almost set. Cool. Refrigerate 3 hours. Cut cheesecake into 24 squares just before serving. Spoon caramel topping into small heavy-duty resealable plastic bag. Microwave on HIGH 40 sec. to 1 min. or just until topping is slightly softened. Cut small piece off one bottom corner of bag; use to squeeze topping over cheesecake squares. Line pan with foil, with ends of foil extending over sides of pan, before pressing crumb mixture onto bottom of pan. Pour cream cheese batter over crust and continue as directed. When ready to serve, use foil handles to remove chilled cheesecake from pan; cut into squares, then continue as directed. Place completely unwrapped packages of cream cheese in microwaveable bowl. Microwave on HIGH 30 to 45 sec. or until slightly softened.